The following map shows the “theoretical” temperature increase, in degrees Celsius, since 1880, for every 2 x 2 latitude-longitude cell of the Earth (all 16,200 of them). The legend shows the temperature range that is associated with each colour. Red shows areas which have already exceeded the IPCC’s +2.0 degrees Celsius temperature limit. Orange shows areas which have already exceeded the IPCC’s +1.5 degrees Celsius temperature limit. Yellow shows areas which are near the IPCC’s +1.5 degrees Celsius temperature limit. 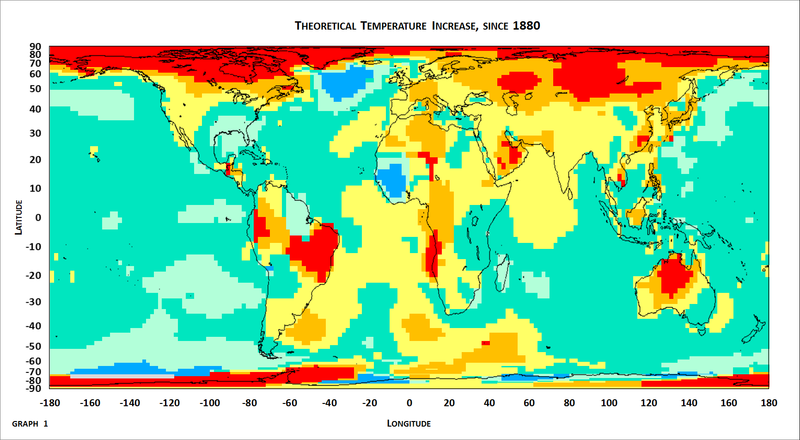 Green shows areas which have warmed by a moderate amount since 1880. Light-green shows areas which have warmed by a small amount since 1880. Blue shows areas which have cooled since 1880. Grey shows areas which have no temperature data. If you would like a bigger version of this graph, then click the link below, and hold on to your hat. It will open in a new tab. You might be wondering why I am showing you this terrifying picture of global warming. What is my motive? The truth is, I am hoping to scare you into sending me large amounts of money. Just joking! Small amounts of money are acceptable too. Really, I just like the colours, and I thought that you might like them too. But if you would like to hire me, to worry about global warming for you, them I am willing to do that. Think of the time that you will save. All joking aside, I have spent a lot of time wondering about whether I should be worried about global warming. This global warming map, is just one more item to worry about. One thing that the map shows, is that most of the extreme warming is happening in cold places. Should we be worried if the average temperature somewhere, increased from -10 degrees Celsius, to -6 degrees Celsius. Personally, I find it hard to get “anxious” about that situation. And I wonder whether the +1.5 and +2.0 degrees Celsius temperature limits, are reasonable. Does that make me a “bad” person? The use of temperature anomalies hides the fact that different locations have different average temperatures. A +2.0 degrees Celsius temperature increase, to a location with an average temperature of -10 degrees Celsius, is very different to a +2.0 degrees Celsius temperature increase, to a location with an average temperature of +20 degrees Celsius. How do the IPCC’s temperature limits account for this difference? The simple answer is, they don’t. For the IPCC, a +2.0 degrees Celsius temperature increase is equally bad, no matter what the average temperature is. A while ago, I wrote an article called, “Solving Global Warming is easy”. My lame sense of humour featured heavily in the article, and because of that, people didn’t think that my solution for global warming was serious. But it was serious. Sort of. It was meant to make people think about whether global warming really IS a terrible problem. Read “Solving Global Warming is easy”, if you have the time. Then think about my solution. Would it work, or is it just playing “mind games”. If you don’t have time to read “Solving Global Warming is easy”, then the answer is, “Colonel Mustard did it, with a lead pipe, in the Conservatory”. The American city, Minneapolis, currently has an average temperature of 8 degrees Celsius. The average temperature of Minneapolis, would obviously increase to 10 degrees Celsius, with global warming. How would the people in Minneapolis cope? Hold on. What if we changed the name of Minneapolis, and called it Denver. Then people would expect the average temperature to be 10 degrees Celsius. You see, managing global warming, is all about managing peoples expectations. Now, the only problem remaining, is what to do about Miami. The average temperature of Miami, is 25 degrees Celsius. Global warming will increase Miami’s average temperature to 27 degrees Celsius. There are currently no cities in America, which have an average temperature of 27 degrees Celsius. So we can’t just change Miami’s name. The only way that you will find out how I save Miami from global warming, is to read my article, “Solving Global Warming is easy”.